THURSDAY 31ST MARCH 2016, LONDON – Today WGSN, the leading global trend authority, announces its WGSN Futures Awards, revealing an international shortlist including Molly Goddard, Hill & Friends, Net-à-Porter, Farfetch, Thinx and an eminent judging panel incorporating Sarah Doukas, founder of Storm Models. 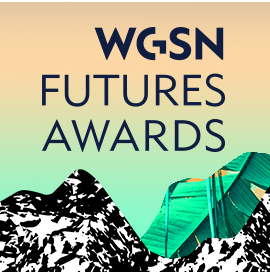 The WGSN Futures Awards recognise the businesses who have done the most to push the boundaries of the international fashion market, and span 14 categories covering core segments of the industry: design, retail, marketing and digital. Taking place on 26 May in a cool central London location, the intimate event will welcome the nominees, the judging panel, sponsors, and press and industry luminaries to a star-studded champagne reception, ceremony and after party. Formerly the WGSN Global Fashion Awards, the awards’ new name reflects its forward-thinking vision and commitment to discovering and recognising the key players that will influence the future of fashion. The shortlisted candidates represent the most exciting talent – both present and emerging – in the fashion industry today. Up-and-coming designers such as London Fashion Week favourites Molly Goddard and Craig Green are shortlisted for the Breakthrough Womenswear and Menswear Designer awards respectively, while JW Anderson’s fashion week partnership with dating app Grindr, and high street giant Topshop’s fashion week offering with Pinterest are shortlisted in the Best Digital Innovation category. The future foresight in which WGSN specialises, and the white heat of innovation are honoured in WGSN’s categories for Sustainable and Innovative Design, where fashion editors’ favourites, the cult ethical US womenswear brand Reformation, and feminine hygiene and fashion brand Thinx, whose responsive design has garnered the brand column inches all over the world, have been nominated. WGSN are proud to be supporting emerging talent once again with global packaging trends leader Avery Dennison, who will provide a year’s mentorship and business support to the winner of the Avery Dennison Emerging Brand category. “We are extremely excited to continue our partnership with WGSN for a third year. The Emerging Brand award was developed to support and nurture brands breaking into the fashion industry and we are looking forward to working with this year’s winner to take the brand to the next level,” said Hannah White, Avery Dennison , Global Senior Manager, Marketing Communications. The shortlisted contestants are up against a stellar cast of international names with designers and brands from Australia, Brazil, Canada, China, Denmark, Ireland, Italy, Paraguay, Turkey, South Africa, South Korea, Spain, UK, USA and beyond. Previous years have seen winners including Colin McDowell, Sophia Webster, Marques’Almeida, Christopher Bailey, Nicholas Kirkwood, Net-à-Porter, Erdem, Karl Lagerfeld, Topshop and Acne. WGSN has assembled a panel of key international industry figures to cast their expert eyes over the shortlist, bringing together social media influencers with retail heavyweights, model agents with designers, to represent the multiple dimensions of today’s fashion landscape. Prominent names on the 22-strong judging panel include Sarah Doukas (Storm Models), Eric Jennings (Saks Fifth Avenue), Tamara Hill-Norton (Sweaty Betty); Peter Ruis (Jigsaw), and Lilah Parsons (Capital One). The WGSN Futures Awards come at the end of the WGSN Futures Summit: Vision 2030, a two-day creative conference that brings together 400 of the world’s leading creatives to debate and define the key trends that will shape the industry over the next 15 years, with an itinerary packed with keynote speakers, panel discussions and opportunities to collaborate and share ideas. WGSN is the world leading trend authority, serving the fashion and creative industries. We enable our members to make better decisions about the products they design, produce and sell by enhancing their creativity and reducing their risk. Our products and services touch every stage of the supply chain from sourcing to design and marketing to retail while our insight, intelligence and data covers long- and near-term trends through to up-to-the-minute retail analytics.